Karadu (also called Karandi), which means basket, is the oldest type of rath. All the other styles came later. Kullu is also known as the country of Athara Karadu. This rath is made of bamboo, is a round shaped basket which is carried in hand and has a diameter of about one and half feet and is of similar height. The mohras of the devi or devata, and flowers are placed within while a number of chhatra (parasol) often one to five are mounted over it. Legend has it that when Jamdagni carrying a Karadu containing eighteen devta mohras reached the Hamta pass, the mohras got scattered and landed at different places in Kullu. The rath of Panchvir of Kotkandhi and Jivnarayan of Janaare of the style of Karadu. There are raths of this style in Mandi also where it is called Karandi. It remains covered with red and green cloth and is carried on the waist or on the head. An open fronted Karadu as opposed to a round one is called Kandu, as seen at Soyal where the rath of Ishri Narayan is of this style. This is a square standing rath and is 4 to 6 feet high. About four inches above the feet there is a plain aboput 4 inches high. Over it there is a square box of about three feet high. Over it is placed a strip of wood of about two inches high. On these strips there are kept holes through which pass the argalas, also known as jamana, which are considered as the arms and legs of the devata. On all the four sides are placed judu of silver. The upper part of the shoulder, on the front side, from the both the corners, it goes up tapering and it takes a conical shape. In such kind of rath there is put one mohra on the top and two or three below it. On the front there is one main mohra. Below there are two and still below them there are three. On the body above there are mohras on the rath of some devis over the jamana but in some raths there are chauk. Many devatas in Kullu have pheti style of rath. Among these are: Nags, Narayan, Chambhus of outer Saraj, Khaddu jal, Devrishi Narad of Ninu, Shaprara Narayan of Barogi, Trijuginarayan of Dayar, Adi Brahma of Khokhan, Bijlesvar Mahadev,Mangleshvar Mahadev,etc. The Kali Nag of Shirad also has a rath like this but it does not have the chhatra on its top. Instead there is a silver band representing the tongue of the Nag.FeathersofMonalarealsoplacedoverit. Thereare12 mohras stuck on it. Chambhu and Trijugi Narayan are carried by four men because their bodies are heavy. Some raths also bear chhatra on their top like those of Trijuginarayan, Gohri Deo of Varituni, and Chotru Nag of Shoja. Gohri deo has in some villages the pheta style and in others the standing dome style. In Hurla it is khada rath and in Janahal it is pheti. in a rath. A silver band is tied all around the mohra for decoration. Some devatas sport a kalgi on their head of monal or peacock. square feet at base and is 8 feet high. Over it is a conical roof supported at all four corners and has twelve wooden wheels. The rath is bound by two girders, a foot thick. These raths are spacious enough to seat about eight to ten persons, the gur, pujari, etc. of the devata. It is drawn by rope made of bagar grass. This is taken out only once in a year during the time of Dussehra, on the tenth of white half of Asvin. 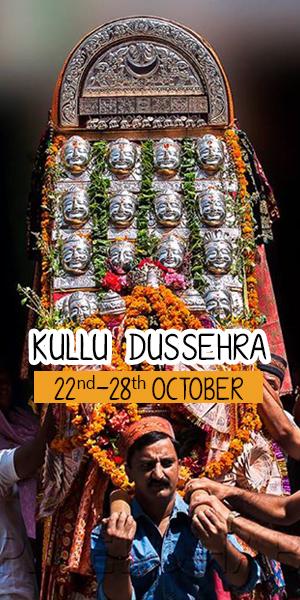 It is decorated with multi-coloured cloth; statue of Raghunathji placed in it and drawn to the Dusshera ground. At Dhalpur the Gohri devata has a small pheta rath which bears 11 mohras and is carried on the head. Similarly there is a square rath of Lakshinarayan in Kamand which is also carried on the head. Some devatas have single pieces of plank as a rath and are accorded the same processes. The rath of Gepang in Lahul is in the shape of a girder, called ‘charshing’. It is adorned with multicoloured cloth strips and to its front end is tied a cloth bag called khyung. This rath is brought from Malana as Jamlu of Malana is considered his elder brother. The residents of Malana cut three trees from jungle and place them in front of the temple. One of them is usually found some distance apart the following morning which is taken as the char of Gepang. When the construction of the rath is completed it is taken to the confluence of Parvati and Beas or Rudranag, where it is bathed. When a mohra is manufactured the sunar also has to be purified. He bathes daily and eats only once a day in the temple itself.